A doctoral student at KTH Royal Institute of Technology, Valentin Dubois, presented the new technique in his dissertation, saying that the findings offer a possible alternative to current optical DNA sequencing processes, which rely on bulky, expensive equipment. The work was done in collaboration with his supervisors. "Our method can, in principle, enable the development of DNA sequencers consisting of a simple USB-connected docking station, in a size equivalent to a small smartphone, costing less than €100," Dubois says. "And anyone could use it without any special training. Hopefully, it will be possible to determine a person's genetic makeup in less than an hour, instead of days, as is the case nowadays." The researchers showed that their technique could produce a type of electrical nanostructure called tunneling junction, which requires the smallest air gap, in the order of a few single nanometers. 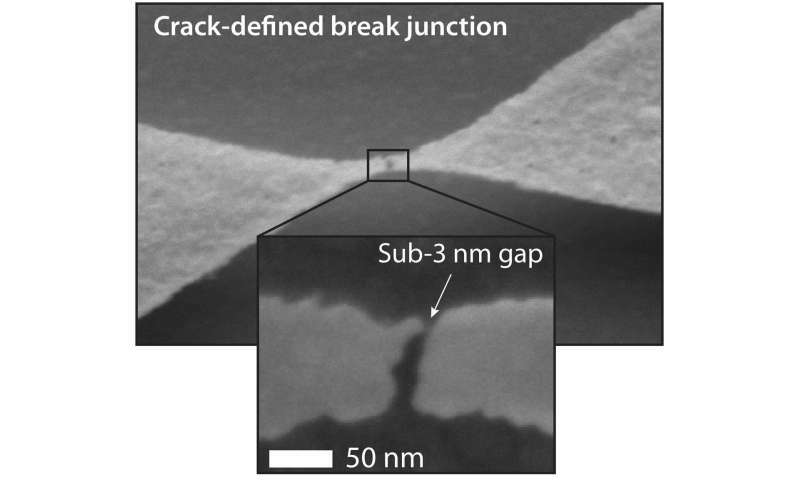 In addition, the dimensions of an air gap generated by cracking can be controlled using conventional microfabrication technology. "That's what really differentiates our technology from other work in the field, which cannot easily control the width of the cracks that are formed," Dubois says. "I discovered that the tunneling junctions that were created in this way could solve key technological challenges faced today in nanoscience. Crack-defined tunneling junctions have the potential to enable yet unexamined experimental configurations to explore and utilize physics, and soon biology, at the nano and molecular levels," he says. After earning his Ph.D., Dubois will work full-time on DNA technologies as a Wallenberg Postdoctoral Fellow at the Broad Institute in Boston.